UFW Stories: "CO FOUNDER RADIO CAMPESINA & EL MALCRIADO & FOOD & JUSTICE MAGAZINE"
"CO FOUNDER RADIO CAMPESINA & EL MALCRIADO & FOOD & JUSTICE MAGAZINE"
1974-1978 Playwright-Actor-Performing in UFW supported functions in California. 1979-1980: Lettuce Boycott Supporter and activist. Memorial Day 1981. Met again with Cesar at his home. Asked to help UFW to organize ‘The Wire” out of a little room at La Paz’s kitchen. The wire became the first internal farm worker microwave radio station. Broadcasting UFW news from La Paz to all field offices. 1981-1984 Help to resuciate El Malcriado as a newspaper. Helped to organize and named KUFW Radio: Radio Campesina. Inagurated the Woodlake Studios. Helpd and assisted in taking equipment for readio signal to the mountains. Prepared news radio and musical programs. Occasionaly served as driver for CEC and coordinated his secutity all over the State of California during negotiations, political campaigns and farm workers events. 1985- Grape Boycott Coordinador-Direcor Pacific Northwest and Western Provinces in Canada. Organized Press Conferences and Rallies in support of the UFW. Studied labor and immigration law at the UFW Law-Clinic office. 1986. UFW Public Relations-Managing editor of El Malcriado, Food & Justice magazines and The Migrant CEC byline column for thousands of labor publications in the US and Canada. Drafted press releases, speeches, press spokesperson, coordinated press conference. 1987-1991 LEFT THE UFW TO WORK FOR THE LOS ANGELES FEDERATION OF LABOR TO HELP LEGALIZE UNDOCUMENTED WORKKERS UNDER THE AMNESTY PROGRAM. OPENED A LAW FIRM CALIFORNIA’S VENTURA COUNTY. 1997. Worked for KUFW Radio just for a month in Bakersfield by an invitation of Paul Chavez. 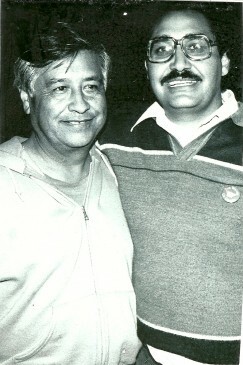 SINCE THEN I HAVE BEEN ONLY A SUPPORTER AND PROMOTER OF CESAR CHAVEZ LEGACY.